You may have been shocked to discover your employer’s fraud, but deciding what to do with your discovery is proving to be even more difficult. You know that what is going on is not right, but is it your responsibility to do something about it? Should you become a whistleblower? What if you lose your job? What good can come of it? Your first step should be to understand the law and how it can protect you. To do that, you should work with an attorney who is experienced in these kinds of whistleblower cases. The attorneys at Neblett, Beard & Arsenault have the valuable experience with qui tam law you will need to ensure that you not only protect your job, but that you also receive the compensation you may deserve. Learn the basics here and then call to schedule a consultation. What Is a Whistleblower or Qui Tam Case? There are several ways an employee can act as a whistleblower. Reporting illegal activities or safety violations to an outsider—such as law enforcement, a federal agency, or the media—is considered whistleblowing. However, qui tam cases are those that involve violations of the False Claims Act. These violations specifically involve defrauding the federal government. In such cases, the whistleblower may be entitled to financial compensation for reporting the fraud. He or she is also offered job protection. Examples of violations of the False Claims Act include Medicare/Medicaid fraud, federal tax evasion, defense contractor abuses, and violations of the U.S. Trade Agreements Act. In a qui tam action, an employee files suit against the employer for defrauding the government. The whistleblower lawsuit will be sealed for at least 60 days, meaning the employer will not know the suit has been filed. During this time, the claim is investigated. The 60 days may be extended multiple times as the investigation proceeds. Qui tam actions are complicated and can be drawn out over months or even years. An attorney experienced with such claims will file the appropriate paperwork, ensure that his client’s privacy is protected, and keep tabs on the claim as it is investigated. If the government decides to intervene in the case, an attorney will make sure that your interests continue to be protected. 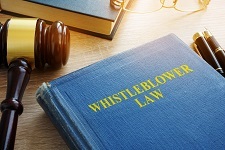 In a successful claim, the whistleblower is entitled to anywhere from 15 to 30 percent of the recovery, depending on how much evidence you were able to provide and several other factors. This can be a substantial award as cases of government fraud often involve hundreds of thousands of dollars, plus additional penalties. When you have an experienced qui tam attorney litigating your case, you can be sure your interests and your compensation will be protected. If you suspect—or know for a fact—that your employer is committing fraud against the federal government, it is never too soon to call an attorney. Even though you are not the one who has committed a crime, you need an attorney to protect you from your employer and from the government, who may be reluctant to pay you the compensation you are owed. Contact us online or call the Louisiana office closest to you to get started. We would be proud to represent you in your fight against fraud.